Welcome to a series of posts that are dedicated to going beyond the shine of technology by examining ways to use digital tools to engage students in real learning. In this fifth post you will discover how careful examination of the verbs in a standard can help you find resources to assist in proper technology integration. In this post I wish to go beyond the idea of finding the tech in the standards. Instead in this post it will be important to see how the technology is being integrated in a classroom. 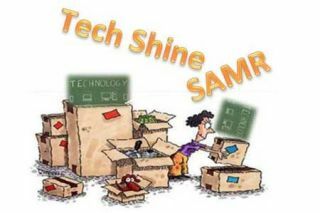 Not only should the technology support the standards, but proper integration of technology will ensure productive and effective technology use and integration in the 21st Century Classroom.. For this reason it is important to take a look at technology under the lens of the SAMR Model. You will find that looking at this model will provide avenues of going beyond the technology shine. Transforming technology into a blended learning experience has become a necessity for those educators wanting to engage student centered learning in the 21st century classroom. While it is possible to create a successful and highly interactive student based learning experience without technology, it is technology that can amplify the learning experience. It must be remembered that amplification will have an effect on great educational pedagogy, but will also do the same for instruction that may not meet the goal. As teachers invite technology into the classroom it has become evident that as learners themselves, they go through formative steps as they become proficient in the blended experience. Through the work of Dr. Ruben Puentedura, Ph. D. the SAMR Model (Substitution Augmentation Modification Redefinition) provides a wonderful lens to look at this progression. It must be understood that the goal is to create lessons that allow for the ability to facilitate learning opportunities that practice Redefinition. At the same time, it must be remembered that all of the stages allow for technology interaction and increased student engagement. This is sometimes not emphasized as teachers sometimes feel they must attempt to put all their lessons at the top tier of SAMR. There are times where simple Substitution is all that is needed and is most appropriate given the learning target. As educators become familiar with the SAMR Model it allows them to reflect and evaluate their technology integration practice while striving for powerful learning opportunities for their students. Keep in mind that learning activities can get blurred between the steps of SAMR. It must be remembered that educators are working on not only a progression, but also a best fit. The first two steps involve technology as an enhancement tool and the last two involve technology as a transformation tool. Many times the steps between enhancement and transformation can take a bit of time as educators practice, reflect, and learn. In the space below you will find those important SAMR Steps. Does the substitution of technology serve the learning target and the standards these targets reflect, or might it actually get in the way. Did the technology substitution assist in student engagement and productivity allowing more time to be involved in curricular expectations? What might have been gained in regards to student learning because of the substitution? In regards to a balance between learning and time spent on standard, what statements can be made? Is the technology adding to the learning experience and curricular expectations? Has overall learning has been improved because of the technology integration? Are student more engaged and producing higher quality work that promotes the standards? How might this use be a step above substitution and does in enhance the learning of the standard? Does the technology allow for some project redesign that enhances the project while still accomplishing the learning objectives? Could this, along with any other modifications, allow a lesson to advance to the next level?. Is time spent using modification keeping the same timeline or less allowing for increased productivity? Has this technological opportunity increased student voice and choice in the activity? While proving additional possibilities, does the redefinition still serve the original standards and purpose? What possibilities exist to increase the student ownership of learning? Is it possible to assess skills the processing and 21st century skills brought about by redefinition? What evidence can be provided to show that the technology is going beyond enhancement and providing a true transformation? All educators must realize that a final goal of any classroom is redefinition. At the same time, there will be times when even the most proficient educators with technology conduct a task at the substitution level. Some educators like to compare this idea to not stepping up a ladder, but instead spending time in a swimming pool. When might one want to go to the deep end and at what point might a return to the shallow end be valuable and productive. It really comes down to the tool fitting the task and learning target. An understanding of the SAMR Model allows educators to reflect on their own progress while investigating ways to use educational technology in a useful and productive way. The SAMR Model allows all educators to view the steps they are taking down the road of technology enhancement toward true transformation. It is a wonderful and exciting journey of going beyong the technology shine. Dr. Puentedura Blog – Why not read SAMR thoughts from the person who came up with the model. Dr. Puentedura provides important insight, reflections, and ideas. Relating to Blooms – Once again learn from the SAMR creator, Dr. Puentedura, as he provides this blog posted at Graphite showing relationships to SAMR and Blooms. SAMR Model and 21st Century Skills – Explore an article that allows educators to look at the SAMR Model through the 21st century skill lens. SAMR Model Example – Take a look at some great example relating SAMR to specific examples that educators can relate to. K. Ward SAMR Discussions Example – Read about SAMR as related to online discussion examples. SAMR… Teaching Above the Line – Discover a wonderful article that allows teachers to begin thinking of taking the SAMR steps. Introduction to SAMR Model – Once again Common Sense Media provides an amazing video and information on the SAMR Model. SAMR for Administrators – This is not just for administrators, but for all educators. This post at Edutopia provides some practical ideas for looking at SAMR. Padagogy Wheel – What an amazing creation that takes apps and aligns them to apps… a must visit website to investigate and learn more from..
SAMR and Coffee – This post points out several blogs and videos that try to draw some analogies between coffee and SAMR… it might be your cup of coffee..